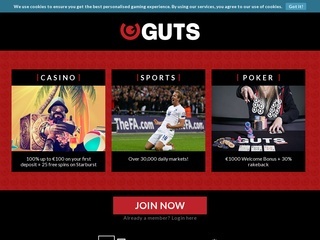 Guts are one of the most famous bookmakers in the world quickly gaining popularity and establishing a name amongst other bookies. The company was mostly famous with their online Casino platform but in 2013 they launched their sportsbook platform. At the moment they offer wide variety of betting options like sportsbets, casino and live casino. The company operates and is licensed by the authorities in Malta. Being a relatively new company in the bookmaking industry, Guts owners have made an effort to create a very user-friendly and honest betting platform. The company has a Class 1 license eligible for Great Britain that ensures the legitimacy of their business in all of Europe. 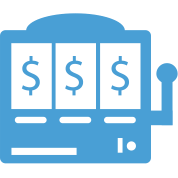 With hassle-free payouts, excellent customer support and a vast selection of deposit and withdrawals methods the bookmaker has quickly surpassed many other established names in the business. They proudly claim they have the highest stamp in gaming safety. The company’s website is easy to navigate and delivers great amount of information. Quality is what Guts are most focused on and this can be seen in their attitude to display the qualities of their staff and the standards that they cover. The company has a real address in Malta where they can be found as well. Once you enter the site, you’ll quickly understand that the developers have made a lot of effort to not only make it look good but functional as well. The simple Sports, In-play, Casino and Live Casino options on the top of the page will take you where all the action happens. The sports section is loaded with options and all kinds of stats. Football, of course, dominates with at the top with Ice Hockey and Tennis coming second and third. The “Quick Links” option is a nice feature where you can arrange all of the sports you like and access them quickly if needed. Livescore and Statistics are available for users who like to stay informed about upcoming or finished events. Another nice addition that is not seen on many bookmakers’ sites is the Blog. 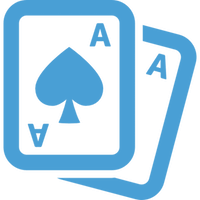 There you can find news about poker tournaments and other events. 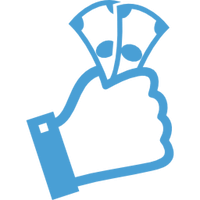 Live betting is supported and can be found in the “In-play” section of the site. There you can place a wager on events while they’re happening. The Casino is full of all the games you can imagine and has quite an impressive collection. In the Live Casino, you’ll find the usual Roulette, Texas Hold’em, Blackjack and Baccarat. Guts have made sure their players can stay connected at all times even on the go. That’s why they have created their mobile platform that doesn’t need additional downloads or installation. To make things interesting Guts have given their players a wide selection of odds. Football, of course, is the king here with over 15 000 wagers available. You can find Match result, Under/over goals, Handicap, Draw no bet and many others. Yes, there are many bookmakers offering a deeper selection than that but it’s worth mentioning that Asian Handicap is also available. It is very nice for a new player in the bookmaking industry. Markets for many other sports are available for Ice Hockey taking second place with over 1500 markets. There are up to 50 markets in a single hockey game. Odd formats supported are Decimal, Fractional, and American. To rank among the best online bookmakers is not easy especially when you try to do it in under three years. When things come to customer support we can surely say that Guts are taking matters very seriously. They offer the SSL encryption that ensures all players’ data is protected and confidential. The fact that they have made all possible contact methods available for their customer is also quite impressive. While other bookmakers offer only contact form support, Guts have lived chat and request a call service. Response time for you question is very fast, and you will not wait long to get in touch with a representative. You can always visit their FAQ page to get information even faster. Supported languages of the platform are English, Finnish, German, Norwegian and Swedish. Everything about the customer support speaks of professionalism and loyalty to their players. Depositing funds into your Guts account is very easy. Every major money transfer method is available with Visa and Mastercard supported. For all the information about the payment options, please check the table. However, if you transfer money with a credit or debit card, you’ll be charged a 2.5% transfer fee. All major currencies are supported. A full list of them can be found in the table. The minimum deposit amount is €10, and the maximum is €5000. All deposits are made instantly. When things come to withdrawal funds from your account, this is where Guts will exceed your expectations. The “Why to wait” policy of the company has become quite famous, and it ensure a fast withdrawal of fund from your account. Except for Bank Transfer where it takes the usual 1-3 days, all withdrawal methods are instant. It is a very nice touch for players who hate waiting a lot of time for their winnings. The minimum withdrawal sum is €20, and the maximum is €5000 per day. For credit and debit cards, the withdrawal fee is 2.50% of the sum and for other methods is €2.50. Currently, there is 100% Sport Deposit up to €200 (Deposit €100 and get €100 bonus). The casino offers a €250 welcoming bonus + 100 free spins. Also a tempting Poker offer – 1000 EUR Welcome Bonus + 30% rakebackThere.